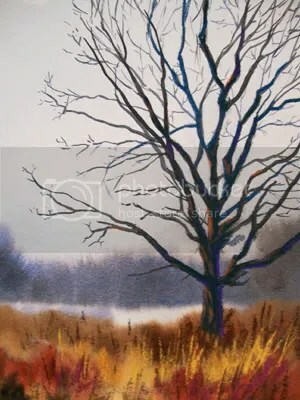 Let’s Paint a Winter Tree! – Let's Paint Nature! 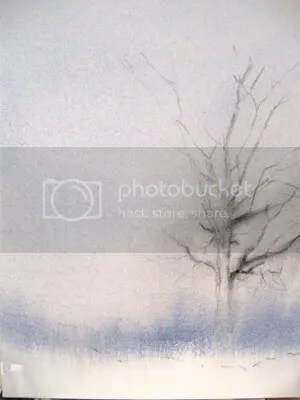 One of the most beautiful structure in nature is the skeleton of a winter tree. It is only after the leaves have all disappeared that one can appreciate its unique form. But doesn’t the tree’s leaf tell its character? Not really, I don’t think so. Here is my reference photo. 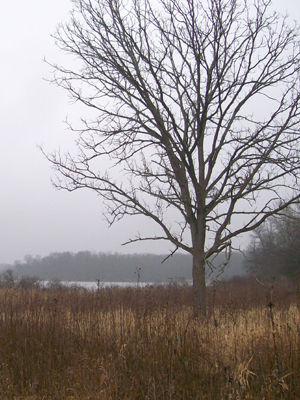 I took this picture in November at the Little Red Schoolhouse as I was walking to the Black Oak Trail. 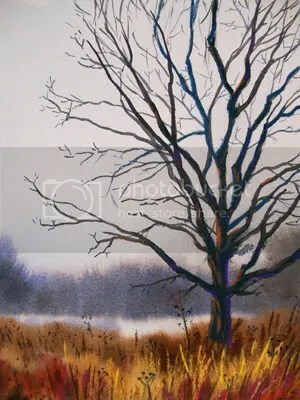 There are many things I am in love with in this picture: the misty background over Long John Slough, the blue hues in the background, the red and amber colors in the field, and that wonderful winter tree standing solemn in the midst of it all. OK, good. This is what we are going to work from. Step 1: I am using an 8×10 Ampersand Pastelbord in white. I like the board because I use a very wet underwash and I never have to worry about warping. Other papers that claim they can take a wet underwash sometimes do not hold up to their promise and 6 months later I see buckling under the glass in the frame. Grrrrr. In this step I made a rough sketch with charcoal vine. Make sure your horizon is not smack in the middle of your board, but it is 1/3 of the way from the bottom. Step 2: Spray the board with clean water. With watercolor paints, I mixed ultramarine blue, a touch of sepia (to tone it down), and lots of water and I painted the sky. 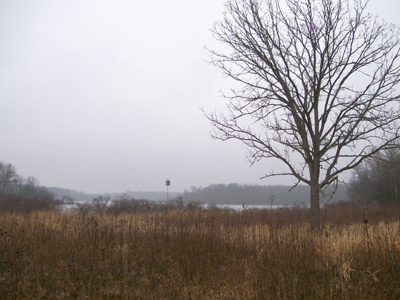 It is an overcast foggy day, so I do not have to worry about clouds. 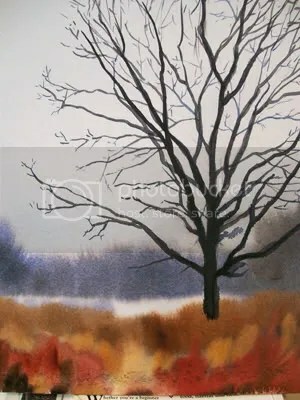 With a less concentrated water mixture and the same paint colors, paint the distant trees, flicking the paint brush upwards to suggest tree top twigs. You will have to repeat painting the distant trees a few times, my board was so saturated with water that the color would almost disappear. 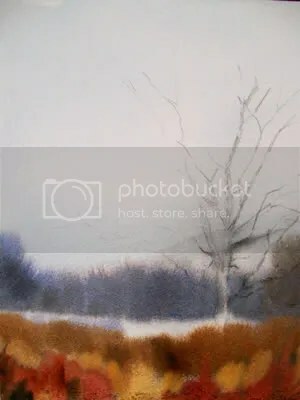 You do not want to wait until the board is dry however because you will not get the effect of trees fading into the distance. Step 3: While every thing is still wet, skip a section of board to represent Long John Slough and paint blotches of field color. The colors I used were: raw umber, burnt sienna, sepia, yellow ocher, and light red (Winsor Newton watercolor tubes). Notice I do not have hard edges but all of the colors are blending well. This is due to the wet on wet painting technique. If the board was dry I would have solid, hard edged splotches. Step 4: Now, for the main attraction… When everything is dry, take ultramarine blue and sepia and paint the basic skeleton of the tree. Using a rigger brush and ultramarine, paint fine twigs and branches. The ultramarine branches suggest that they are in the back and the sepia colored twigs look closer to the viewer. We are done with using watercolor paints. Let everything dry. Step 5: Take your pastels and go over your tree. 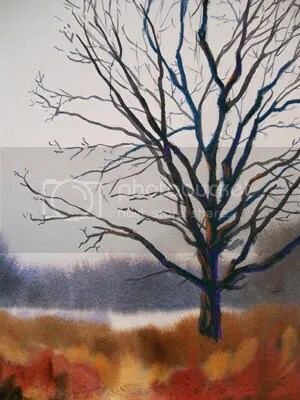 Keeping the darkest color as shadow, paint the highlights of the tree with browns and oranges. I use a tiny bit of purple in the shadow for some pop. Don’t go crazy here, a little goes a long way. Step 6: Now we can paint the field. I used brown, yellow and purple/red pastels for the grasses. Pick a color that is contrasting to the watercolor underwash. Use the side of the pastel stick (you may need to rip off the paper) and go up and down for grasses. Do you see how 3-d this is starting to look? I LOVE it! Step 7 Final: Last but not least, in my reference photo I noticed these lovely weed heads shooting through the grasses. It is so easy to paint these; just a stick and a few dots above and you’re done! This painting will be on display and for sale at the LaGrange Art Gallery after January 4, 2010. 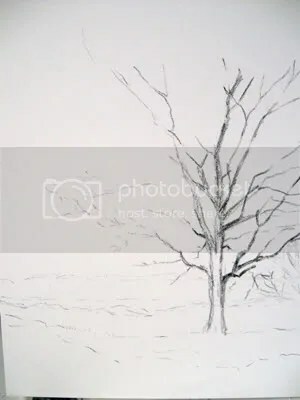 I hope you enjoyed this step by step demonstration on how to paint a winter tree. I really like your approach and technique and am looking forward to more…..
Rachel: I never clean out my garden at the end of fall for two reasons; 1. the birds and rabbits still use the garden as protection and 2. I love looking at the structure of the expired plants in winter! What a great subject to paint! So lovely. Great capture of light. Pingback: Matthijs Winnubst | Blog | Weekendoverweging: hoe schilder ik een boom?